Pickup from Udaipur airport and transfer to Hotel. On your arrival you will be check inn at your hotel. Evening will be free at your leisure. Overnight at the hotel. Morning Leave for Nathadwara – 1 Hr. After darshan at Nathadwara leave for Chittaurgarh /2 Hrs at 11:00 AM. Leave for Chittaurgarh approx. 100 Kms. Sightseeing Chittaurgarh Fort including Rana Kumbhar Palace, Fateh Prakash Palace, Jaya Stambh, Padmini’s Palace. Evening back to Udaipur. Overnight at hotel. After Breakfast you depart for Jaisalmer via Pokhran by surface approx. 490 kms/ 9 hrs. On arrival you will check in at your hotel. Evening will be at your leisure. Dinner at hotel. Overnight at the hotel. Morning you will proceed for a half day sight seeing tour if Jaisalmer visiting Gandisar Lake, Jaisalmer Fort and Patwon Ki Haveli. 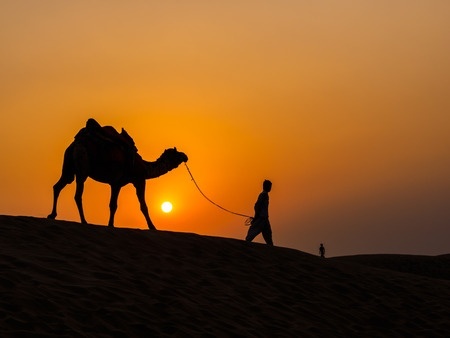 Late afternoon you will proceed to Sam village to witness the spectacular sunset on the Thar Desert. You can also enjoy a camel ride on the sand dunes. Dinner in the Cap. Overnight at the Swizz tents. Morning will be free in Jaisalmer for leisure aactivities. Evening witness the spectacular sunset on the Thar Desert. You can also enjoy a camel ride on the sand dunes. Dinner in the Cap. Overnight at the Swizz tents. After breakfast leave for Tanot approx. 120 Kms/ 2 Hrs. Enjoy the desert on the way. Darshan at Tanot and depart for Jodhpur by surface (approx. 415 kms/ 8 hrs). On arrival in Jodhpur you will check in Hotel. Evening will be at your leisure or free for shopping in the market of Jodhpur. Overnight at the hotel.Pls. Note : The Drive is more this day, so pls start early around 7:30 AM from the Jaisalmer hotel. The roads are plain and with very less traffic so drive is comfortable. Morning after breafkast you will be transferred to your Jaipur via Kurki (Meerabai Birth Place). After visit the Kurki continue drive for Jaipur. En route you can see Pushkar (One of Lord Brahma Temple in India) and Ajmer Sharif Dargah. Evening arrive & check inn at hotel. Evening you will be taken to Chokhi Dani where you can enjoy a traditional Rajasthani Meal(on own). Overnight at the hotel. Mroning depart for a half-day excursion to Amber Fort. Enjoy the elephant ride (on own) to the fort. Later in the afternoon depart for half-day sightseeing of Jaipur visiting, Jantar Mantar( observatory), City Palace Museum, Hawa Mahal, Evening will be at your leisure. Overnight at the hotel. Morning after breakfast depart for a day excursion of Chand Bawri, Step Well. Late afternoon back to Jaipur. Evening will be at your leisure. Overnight at the hotel. Morning after breakfast transfer to Ranthambore hotel – 190 Kms. On arrival check inn at hotel. Take a evening Jungle ride. Night at Hotel. Overnight at the hotel. Early morning jungle ride to Ranthambore. After breakfast in the hotel leave for Local Sightseeing including the Ranthambore fort. Afternoon check out from the hotel and back to Jaipur. On arrival transfer to Railway station for onward journey. Train from Pathankot at 4:25 Pm. Overnight in Train. Arrive Pathankot Railway station, Pickup & Depart For Dharamshala by surface (90 kms.approx. 3 Hrs) Afternoon you arrive Dharamshala and check inn at the hotel. Rest of the day at leisure. Overnight at the hotel. Morning After Breakfast Proceed to visit the Spiritual city of Dalai Lama. You visit the Macleodganj area covering the Dalai Lama Teple, Bhagsunath, Dal Lake, St. John’s Church & Talnoo Nadi. Afternoon you visit Kangra Art Museum, Kunal Pathri, Tea garden & War Memorial. Evening will be at your leisure. Overnight at the hotel. Morning after breakfast depart for Khajjiar by surface approx. 169 kms. Afternoon you arrive Khajjiar and check inn at the hotel. Evening will be at your leisure. Overnight at the hotel. Morning After breakfast depart to explore the scenic beauty of Khajjiar. Enjoy the horse ride (on own). Afternoon check out from the hotel, depart for Dalhousie via Chamba “78 kms” (including sightseeings). En route visit Chamera Lake also. Evening arrive and check in at the hotel. Overnight at the hotel. Morning after breakfast complete day sightseeing of Dalhousie viait Panjpula, St, John Church, St. Francis Church. Evening will be at you leisure or visit the Mall Road. Overnight at the hotel. After Breakfast depart for Amritsar by surface approx. 190 kms/ 5 hrs. On arrival check inn at hotel. and proceed to Wagah Border (Indo-Pak Border). Evening enjoyed Indian Soldier Parad with Flag Clossing Ceremony. Later return to hotel and rest at hotel. In late evening you can visit Golden Temple. Overnight at hotel. After Breakfast depart visit Jaliyawala Bag and Golden Temple. Afternoon check out from the hotel and depart for Amritsar railway station for onward journey. Train fro Delhi at 11:55 Am. Reach Delhi at 8:00 Pm. Pick up from Delhi Railway station and transfer to hotel. Overnight at hotel. After breakfast you will proceed for Delhi airport for onward journey.